Lesson 1 (CC2 level) - The Chip's Challenge Wiki - The Chip's Challenge Database that anyone can edit! Not to be confused with Lesson 1. 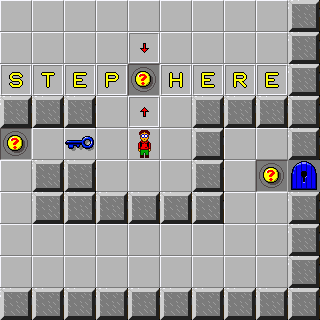 Lesson 1 is the first level in Chip's Challenge 2, and the first of the lesson levels. It was created by Chuck Sommerville. Pick up the blue key by walking over it. Notice the blue key in the box below. It means you have a blue key. Use the blue key to open this door by walking into it. Notice the blue key is now gone. You used it opening the blue door. Use the red key to open the red door. Use the yellow key on the yellow door. Use the green key on the green door. Notice you still have a green key. Use the blue key on the other door. Don't open this blue door! If you do, you will be stuck and have to press F1 to restart. Now you've done it. You're stuck. You don't have a blue key to go on. Press F1 to restart. When you walk on dirt, it turns to floor. When you have more than one of the same key, you can see the count go up to 9. Step out onto the ice and take a slide. Now pick up the ice cleats and walk on the ice to the next clue. Notice that there are ice cleats in the box below. This means you have the ice cleats. Grab a handful of bonus flags for your hard work so far. You can't carry a tool of this type across this sign. The red thief takes all tools from the bottom right box. He also takes half your bonus points. The blue thief takes all keys from the bottom left box. He also takes half your bonus points. You can't carry a key of this color across this sign. Pick up all of these chips. As you pick the chips, watch 'chips left' counter below count down. When the 'chips left' counter reaches zero, you can pass the chip socket. Green 'force floors' are like one-way moving sidewalks. These green 'magnet shoes' will let you walk on force floors without getting carried away. If you are on a force floor, you can step off sideways. You can stand still, sort of, by walking against the force floor. 'Swivel doors' turn as you walk through them. They will only turn if you push on them as you leave the square. Work your way through this maze to the exit by the red arrow. Be careful here! The water can drown you if you aren't prepared. If you do die, press F1 to restart the level. Use these "flippers" to safely cross the water. Be careful here! Walking into the fire can burn you if you are not prepared. These "fire boots" will let you walk on fire safely. 'Floating turtles' sink when you step off of them. You can only step on them once. 'Pop up walls' spring up from the floor when you step off of them. You can only step on them once. Push this dirt block into the water to make a dirt bridge. You can't push a dirt block over dirt. Clear out the dirt in front of this block before you build the bridge. Push both of these blocks into the water to make a bridge that is two squares long. You can only push one dirt block at a time. After you push the dirt into the water, remember to step on the dirt so you can push the second block over it. Be careful here! Walking into these bombs will blow you up! 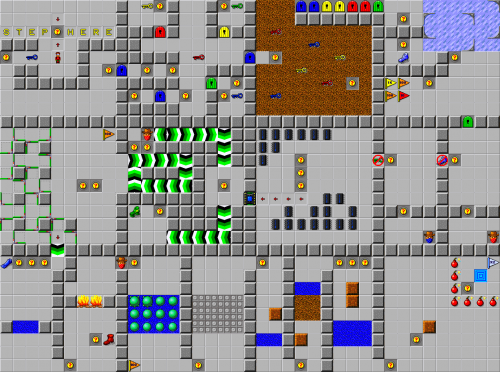 Push this dirt block into a bomb to clear the path to the exit. The exit is the blue square! Congratulations! You made it to the exit! Pick up the x2 flag to double your bonus before you leave. This page was last edited on 5 March 2019, at 22:41.